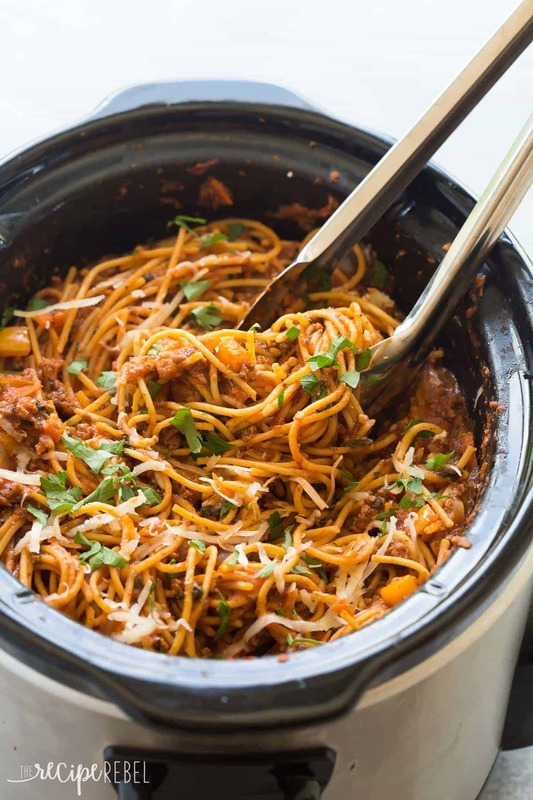 This Healthier Slow Cooker Spaghetti and Meat Sauce is loaded with veggies and protein but tastes just like your old favorite! It cooks completely in the slow cooker — even the pasta! Includes step by step recipe video. I am seriously so excited about today’s recipe. It just doesn’t get any better than an entire, healthy meal with real ingredients made completely in the slow cooker. That bowl you use to microwave your ground beef? Yeah it doesn’t count on our tally. You heard me — read me?? — correctly. We are skipping the extra pan and microwaving our ground beef for this spaghetti sauce, and no one will ever know the difference, I promise. With our oldest in kindergarten this year it’s become even more important that I can manage to get healthy, hearty meals on the table on a regular basis. She is one of those rare, beautiful species of 5-year-olds that still naps regularly, so she needs a little extra something to keep her energy high on school days when she doesn’t get to bed! Maybe you have heard by now that I struggle to get my veggies in most days. Usually, I’m sneaking them in something delicious like this spaghetti sauce — they cook down and all the flavors work together so that you don’t feel like you’re just eating carrots or peppers or spinach (or whatever else you throw in it!). It’s also perfect for using up whatever you have left in your garden — almost anything goes here, including the last of those herbs! Mushrooms, zucchini, fresh tomatoes — those are all great additions as well. 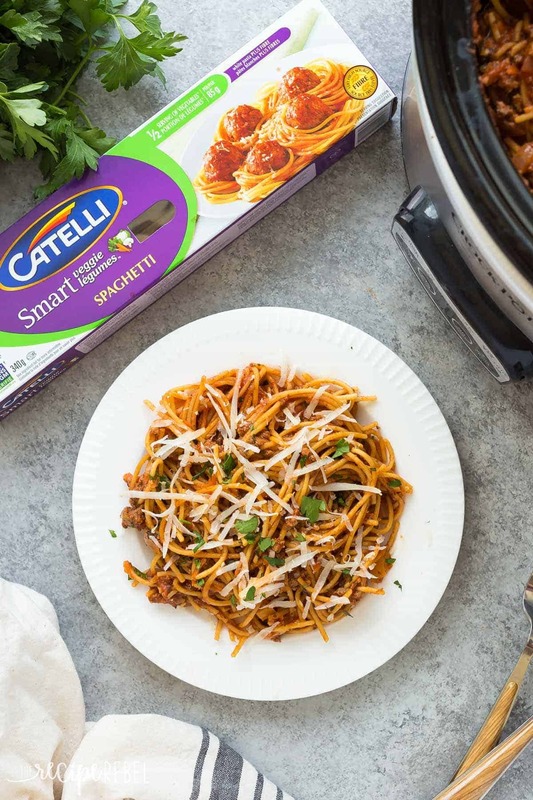 *This post is generously sponsored by Catelli — thank you for supporting the brands that make The Recipe Rebel possible! Back in March (along with this Baked Mac and Cheese Cups recipe! ), Catelli announced that they were giving away 3 $10,000 family reunion packages to families across Canada to celebrate 150 years of providing quality pasta popping up on kitchen tables across the country. The winners were chosen, and families gathered and celebrated together. Click here to see how everything came together in the end! 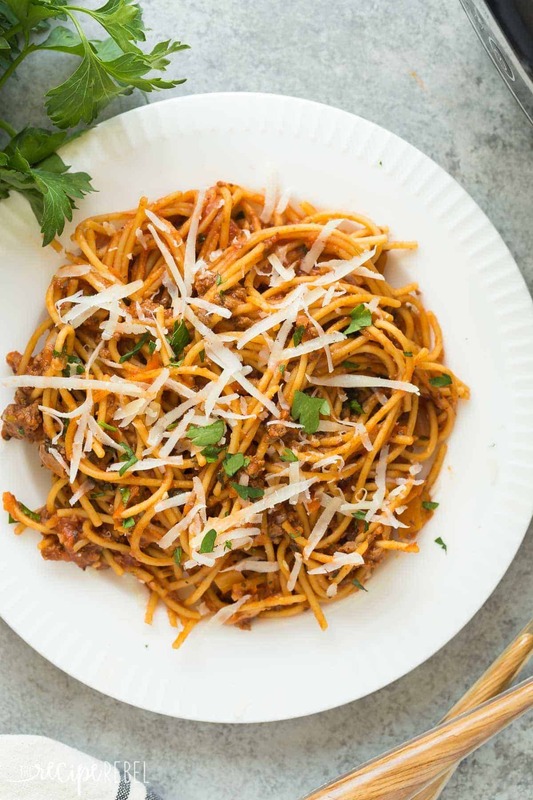 This Healthier Slow Cooker Spaghetti and Meat Sauce is loaded with veggies and protein but tastes just like your old favorite! It cooks completely in the slow cooker -- even the pasta! Includes step by step recipe video. In a medium bowl, microwave ground beef on high until cooked, about 6-8 minutes, stirring every 2 minutes. Drain any juices and add to 4-6 quart slow cooker. Add onion, pepper, carrot, spinach, broth, tomatoes, garlic, basil, oregano, salt, parsley, and pepper. Stir well. Cover and cook on low for 5-7 hours or high for 2-3 hours. Break spaghetti in half and stir into sauce in slow cooker. Cover and cook on high for 5 minutes, stir to break up the pasta -- you don't want clumps! Cover and cook another 5 minutes. Stir. If pasta is cooked to al dente, serve, or cover and cook on high for a few more minutes if necessary. I loved the idea but it didn’t quite work for picky kids. Looking forward to trying some of the other yummy looking recipes though. I have made this previously, I am craving this for dinner tonight but do not have the time to wait for it in the crock pot. Does anyone have the conversions for the Instant pot? Thanks Heather! I have never tried in the Instant Pot but I will have to try it soon! LOL I love that you microwave the beef here! I’m all about saving that extra dish. I don’t know how many times I go to make a meal and realize that the meat is still in the freezer – it’s so disappointing! I absolutely love the fresh vegetables in this. I’m not necessarily a healthy cook by any means, but I do eat healthy during the week (weekends are a free for all in my house!) and this is the perfect kind a recipe for someone who works all day! I might replace the ground beef with ground turkey (even though it’s not as good) because, well, somehow these years of unhealthy cooking have given me high cholesterol. Go figure. Made this for dinner tonight, husband approved and the three year old gobbled it all up. He didn’t even notice the hidden veggies! ??‍??? So you only cook the pasta for about 10 minutes? About that, or longer if needed as specified. The cook time will depend on a lot of things since you are adding it right to the slow cooker — how hot is your slow cooker, how full it is, etc. I would check every 5 minutes until cooked. I love my pasta. I love my slow cooker. So this is perfect. Just figured I’d throw a little tip out there for slow cooker pasta… if your slow cooker has a “keep warm” setting, set it to that and check every 5 mins until your pasta is just under your desired consistency then turn off the heat and let it stand for another 5 mins. Love the extra veggies in here! This sounds like a great slow cooker meal. I need more meal ideas like this! I’ve never thought to microwave ground beef before, but that definitely saves an extra step, and an extra dish, too! Love that this sneaks in some veggies and is on the healthier side. I wish I could dive right into this for breakfast…looks perfect! It makes it so much easier (and less mess!)! Thanks Gayle!